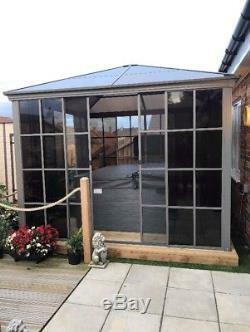 Here Is our Deluxe Knightsbridge Polycarbonate 3m x 3m Hard Top Gazebo with sides and sliding doors. The Polycarbonate roof is uv resistant so you can have full protection from the direct sun rays, but maintain the daylight. The Gazebo frame is made from aluminium with a powder coated Grey/Taupe almost Grey in daylight it requires zero maintenance. You have four upright legs with a steel (for strength) powder coated finish foot plate on each leg to secure the Gazebo to any surface. Plus a floor plate for the sides and doors to fix to which also has fixing holes to secure to the ground. 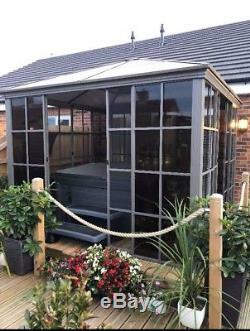 The Knightsbridge solid roof polycarbonate Gazebo can be used for corner sofas or sofa sets, Dining table Sets or a popular choice for hot tub cover canopy or cover/outdoor room. 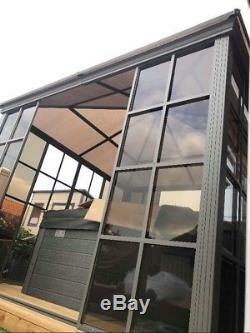 With the 4 sets of mesh sliding opening doors on each side that are supplied with the Gazebo you can have shelter from wind and rain and mosquitos or simply to give a nice shade. These doors have a fine mesh pulled tightly into the door frame to allow air circulation, but will keep wind and rain out to a degree. They are used widely in Canada and serve the purpose for this model perfect. 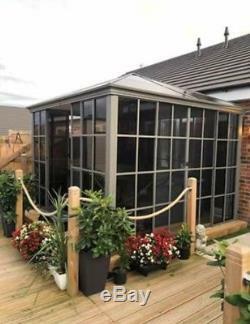 All 4 sides have sliding doors on the Knightsbridge 3x3 Gazebo that will draw across to the middle with door knobs and lock together with a full length magnetic strip inserted into the edges of each door so you can have them all or part open. The tinted sides made to replicate glass are made from a micca again pulled tightly into the aluminium frame to give a flex finish that will take a large degree of movement without cracking or smashing. These were tested with many other materials before finding the perfect product for our gazebos. The legs and body have sevaral secure points so you can fix the gazebo down to any surface. They have a decorative detail in the upright legs and over head ogee. The main bulk ogee is secured with 3 fixings on each end fixed to each leg and then a decretive cornice cover plate that will cover the fixings from view. The garden structure will come flat packed with full detailed and informative step by step instructions, we are also here to advise you if you have any concerns or problems while fitting or before purchasing the gazebo as we install these gazebos on a regular basis, so we know how to overcome any problems that could arise, however this is in the main relatively straight forward, but does take a long time to complete the build from start to finish. We can also offer a fitting service to most areas of the uk. Note these gazebos are not steel. They will not rust, they are not copies as we devoted time effort and testing of our product before going on sale, they are the original item and will not have sub standard materials, there is no fibre or wood in the gazebo or sub standard thinner cheaper parts used. We pride our product on quality and with the assistance it will last for many years and withstand our climate weather all year round. There you have all the information you should need to make your decision and become another happy customer. Note this unit is not steel apart from the floor fixing plate, it will not rust and mark your patio or rust internally and weaken, it will not blow away if secured down correctly tested and approved up to 80mp winds, tested for snow lead bearing up to a foot over the roof surface. It will not require a new roof every year or so like canvas models and will not require any maintenance, We can always supply replacement panels and parts should you require them in the future. If we instal the gazebo we will increase the warrant to five years. Other types of models are available. 3m x 4.3 (curtain) sided In Stock. And 3x3.6 curtain sides in stock. 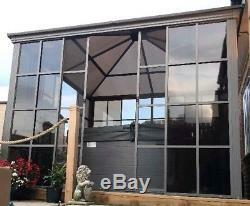 New 3.65 x 4.3 Knightsbridge deluxe Sliding Door Garden House like this one but larger. With sliding doors all sides. 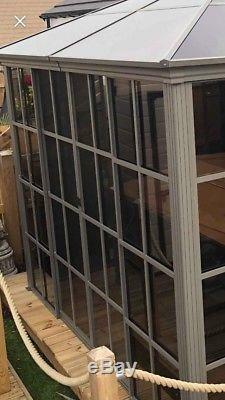 And the Knightsbridge 3.6 x 3.6 sliding door model in stock. 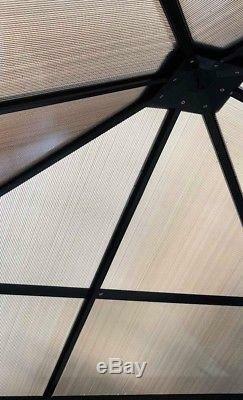 Octagonal Polycarbonate roof Gazebo Curtain sides Now available in stock. And wall mounted with sliding roof models 3x3.6 and new 3x4.8. 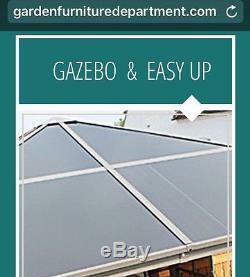 New metal galvanized roof solarium models in black now available 3.6 x 3.6 sliding doors and windows and the 3.6 x 4.3 these are very heavy duty models and have sliding windows on each section. With two door opens to position at your choice. New 3.65 x 4.86 curtain sided model now available to order. Nothing worse to have to collect and collect at your expense if its not the right size or model. The footprint or floor size isnt the same as the gazebo size as there is 100 overhang on the roof. 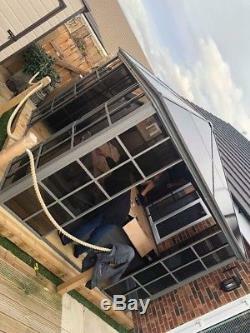 Also you will require a larger area to build the gazebos as the roof panels are slid in from all sides and then secured with trim and screws. We advise at least the width of a step ladder as a minimum all sides, but more will make the build easier and quicker. 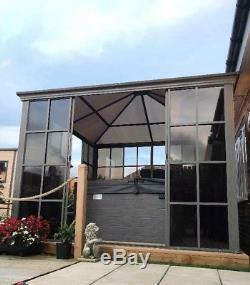 The item "3m Solid Roof Garden Room, Hot Tub Shelter, Sides +Sliding Doors, Permanent Gazebo" is in sale since Monday, September 17, 2018. This item is in the category "Garden & Patio\Garden Structures & Shade\Gazebos". 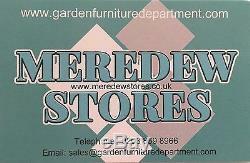 The seller is "meredewstores" and is located in Basildon. This item can be shipped to United Kingdom.